The offices at Astros County will be empty tomorrow, as all U.S. based correspondents will be nursing hangovers. They got to party in a way that they haven't partied for in a decade, because the Astros managed to record a famous postseason win over the Yankees, by a score of 3-0. And because this is a one-game series, that sends the Yankees home for the winter. The youngest team in the AL just went into the intimidating home stadium of the oldest team in the AL (by average age), and shut them out. The storylines for the Astros tonight were around great pitching, athletic defense, catcher framing, power, speed and a solid bullpen. Sound familiar?? It has been happening most of the season, as the Yankees found out tonight. Because this game was nationally televised, and because all decent Astros fans - those who were not flying home from the West Coast, anyhow - would have been watching, I will do a slightly different format to the recap tonight. Sound good?? Cool! The Astros set their roster with 16 position players and nine pitchers. They carried Mike Fiers as an extra starter, so seven bullpen guys were included. The notable position player inclusion was Matt Duffy, who took the spot that many thought may be given to Jon Singleton. The Astros' on-field lineup was predictable with the hot-bat of Colby Rasmus manning left field, and Carlos Gómez patrolling CF. Luis Valbuena was at third, and Chris Carter at first. Jason Castro was behind the plate - no surprise there - and the remaining three players were also no surprise - Altuve, Springer and Correa (who were also batting 1-3 in the order, respectively). Tanaka started well enough against the Astros, striking out Altuve on a full count (swinging at a cutter up and away), and Springer (swinging at a cutter down and away) on a 2-2 count. Carlos Correa was retired on a medium depth fly out to CF to retire the side. Dallas Keuchel struck out Brett Gardner (fastball down-and-away) then walked Chris Young with one out. He only advanced as far to second before Alex Rodriguez was retired looking at a high strike - a 2-seamer up in the zone. The first run of the game was scored on the first pitch in the second inning. Colby Rasmus was batting fourth. When Tanaka missed a down-and-away target glove side, Rasmus pounced. The ball would have caught the inside corner of the strike zone, but Rasmus dropped the barrel on it, and he pounded it. He walked slowly out of the box, then flipped his bat. The ball landed deep in the RF power alley - about 20 rows back - and the Astros took the lead. Evan Gattis then flew out to the wall on a pitch in a similar location. This pitch was a cutter, and was down-and-away to the righty. Brett Gardner made a nice play at the wall. Carlos Gómez then grounded out - three consecutive balls put in play on the first pitch of the at bat - before Luis Valbuena singled to straightaway CF to take first. Chris Carter then walked on a full count, as did Jason Castro, so the bases were loaded with the top of the order up. But Jose Altuve had a 1-2 pitch rise on him a little, and he grounded it to third base, with the force out being recorded at second. Inning over, but the Astros carried a 1-0 lead. The bottom of the second was a very Keuchel-esque inning. Two grounders (one back to the pitcher), a single and a strikeout looking (Chase Headley was caught looking on a 2-2 fastball inside). No damage was done, and the base runner never advanced past first. Leading off the third, George Springer doubled over Brett Gardner's head to the base of the wall in straightaway CF. They pitch looked like a cutter down and away, and Springer went down and got it, hammering a line-drive to the base of the wall. Springer couldn't advance, however, because of two grounders to third base and a fly out - one of the grounders was a very nice barehanded play to retire a hustling Gattis for the final out of the inning. Keuchel settled in from the third frame onward. Two more strikeouts - Brett Gardner on a 2-2 breaking ball away and Chris Young on a 2-2 changeup down and away - were recorded in the bottom of the third. In the fourth frame (and nursing a 2-0 lead now), Keuchel struck out Carlos Beltrán on a full count before getting A-Rod to line out to Springer (who made a great play in the corner) and McCann to ground out. In the fifth frame, Keuchel recorded two outs in the air to CF - one was well hit - but no Yankees reached base. How did the Astros get to 2-0?? It took one pitch of the fourth frame - Tanaka was facing Gómez, leading off. 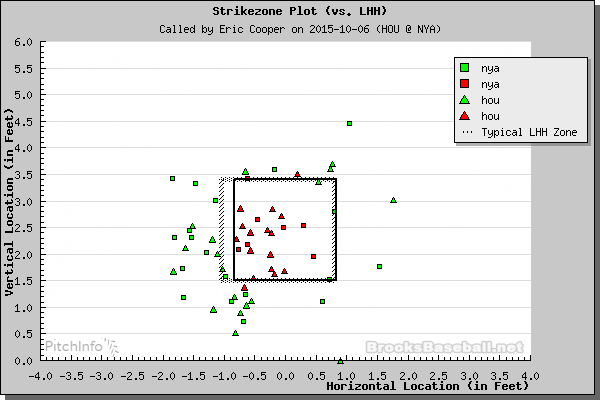 McCann called for a slider down-and-away, Tanaka missed arm-side-and-up, and the ball caught the very top of the zone. Gómez may have been injured, but he wasn't going to let that one go by, and he pounded it to the back wall of the bullpen to double the lead. The remainder of the inning featured a Valbuena strikeout, a Chris Carter walk, and a nicely-turned 3-6-1 double-play on a Castro grounder to end the inning. In the fifth, the Astros were retired in order, and in the sixth, the Yankees pitchers faced the minimum after a Colby Rasmus walk was followed by a 6-4-3 twin killing. The bottom of the sixth was pivotal in terms of the game. Keuchel started by allowing a leadoff single to Did Gregorius on a hard grounder just to the left of a diving Altuve. Brett Gardner was the next hitter, and he struck out for the third time in three at-bats - another breaking ball down and away. Chris Young followed by hitting the ball hard to the left side of second base, but that is Carlos Correa Country, and he flagged it down to his glove side, underhand-flipped it to Altuve, and recorded the force-out at second. Some comment was made regarding Gregorius' slide into Altuve, which was late and ended well past second base, but Altuve was unhurt, although he was unable to complete the double-play. So with two outs and a runner on first, Keuchel gave up a hard-hit line-drive single to CF to Carlos Beltrán, which put runners on first and second. Keuchel had given up three relatively hard hit balls - two grounders - in the frame. A.J. Hinch took a slow wander to the mound, and with Chad Qualls warm and throwing in the 'pen, loyal reader Roseana would have had her heart in her mouth. But Hinch left Keuchel in, and he responded by throwing a high cutter - in a similar location to where A-Rod lined out in the previous at-bat, but moving in the opposite direction (back toward A-Rod this time), and a little slower. That was enough to keep A-Rod off the pitch, and he popped it up to Carlos Gómez in CF for the third out of the inning. In the Astros' half of the seventh, Chris Carter worked this third walk of the game. That brought Jonathan Villar out of the dugout to pinch run. He stole second, but it took him four pitches to do so, and the fourth pitch was the one that Jason Castro struck out on. Villar had taken a huge lead and the tag was well late, but he was in scoring position for Altuve's at-bat. Altuve faced Dellin Betances, and on the second pitch of the at-bat, Betances tried for a slider down and away. In freakish fashion, Altuve reached out, got the barrel of the bat on the ball, and flipped it into shallow LF. Villar had plenty of time to score, and the Astros took a 3-0 lead. So from there, it was a matter of shutting the Yankees down. Tony Sipp threw the seventh, and he was solid in walking Chase Headley with one out, but allowing no other baserunners. Sipp made a clutch 3-2 pitch on Greg Bird for the second out - after he struggled with getting his breaking ball into the sort of territory where a lefty may have a swing at it, he retired Bird on a perfect fastball on the outer edge. Will Harris got the eighth, and he set the side down in order - two grounders and a pop out. Luke Gregerson got the ninth, and he was dominant. Carlos the Jackal went down swinging on three pitches, then A-Rod struck out swinging on four pitches. Brian McCann grounded out on the first pitch of his at-bat, perhaps correctly working out that Gregerson had his command, and the first pitch he saw may be the best. Both strikeouts were recorded on Gregerson's slider - a back foot one to Beltrán, and a slider away to A-Rod. McCann's grounder sparked some serious celebration. The big offensive contributors were (or course) the home run hitters - Carlos Gómez and Colby Rasmus. Both went 1-3, and Rasmus added a walk. Valbuena, Springer and Altuve all went 1-4, with Altuve's hit an RBI single, and Springer's hit a leadoff double. Jason Castro went 0-2 with a walk - but considerable comment was made about his framing abilities - and Chris Carter did not record an official at-bat, walking three times in three plate appearances. Altuve and pinch-runner Villar both stole bases. The pitching was great. Dallas Keuchel was a little nibbly to start the game, but he found his groove, and recorded 7 strikeouts versus one walk and three hits in six frames. On short rest. All hits were singles. One batter got to second base. Kudos to Hinch for removing him after six - Keuchel's hardest-hit balls were pretty much all recorded in the fifth or sixth frame. I was a little surprised that he chose Sipp for the seventh and Harris for the eighth, but both were solid, allowing only one baserunner (on a walk) between them. Hinch is clearly playing the hot hand in the bullpen. Gregerson was dominant, closing out the win. Not a lot to see here, folks. Move on. Perhaps Houston got one call away to righties, but New York got one down-and-in to righties. Both teams had a couple of pitches around the margins that weren't called. So the Astros head off to Kansas City for at least three more games. Extending the season at this point is highly desirable, and a quick 11-game win-streak would do a lot for the Astros' franchise. We will have a preview of the series up tomorrow. Happy celebrating, AC readers. Great game! The kids really looked good- sharp and aggressive. I was a little surprised Hinch was considering using Qualls in the 6th and very glad he didn't. I still can't believe Carter walked 3 times!!! Whooo hoooo!!! Game time was fun!!! On to Thursday. my worst fears were not realized last night. Can't wait for KC! This game was awesome. I knew that it was going to be a grind because of the pitching duel. I knew that if we got to their pitcher early then the game was ours. The astros were too hot coming into this game and so was Colby Rasmus. That was a huge hit by him and them gomez coming in cltuch at the end. Awesome game and go Astros.